On the Tuesday before His crucifixion, our Lord went into the temple for the last time and denounced its inhabitants as being the "sons of those who murdered the prophets," a "brood of vipers," and those destined for the "condemnation of hell" (Matt 23:31–33). They would fill up the measure of their father's guilt. By crucifying of the Son of God and by their continual rejection of the gospel message and it's messengers they would prove whose sons they were. Satan was truly their father and "like father, like son." In the seventh and final woe that Jesus pronounces on Jerusalem, He gives the death sentence for the city and said that generation of people would feel the wrath of God for their rejection and murder of the Son of God (Matt 23:34–39). The destruction of the temple would symbolize God's repudiation of it. After this scathing rebuke, Jesus leaves the temple never to return to it again. As Jesus and His disciples were walking away from Herod's Temple, He told them that the day was coming when "not one stone shall be left here upon another, that shall not be thrown down" (Matt 24:2). Apparently the disciples were stunned into silence by our Lord's statement. His disciples privately ask, "When will these things be? And what will be the sign of Your coming, and of the end of the age?" (Matt 24:3). The destruction of the temple was such a remarkable event that the disciples could only think of it being accompanied by the end of the world and the second coming of Christ. Jesus clears up their misunderstandings and answers their questions in order. First, He tells them about the various signs which would be seen prior to the destruction of the temple. Second, Jesus explains there will be no signs given prior to His return and the end of the world. Jesus called the destruction of Jerusalem the "the days of vengeance" (Luke 21:22). The destruction of Jerusalem was an act of God's vengeance and judgment, not Rome's; these would be the days when people were punished for their sins. The destruction of the holy city was not an accidental or arbitrary act, but the just recompense of reward for those who rejected God's Son. 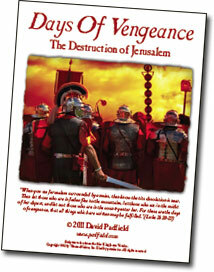 We are pleased to offer a new book, Days of Vengeance, by David Padfield. This book is a very detailed examination of the destruction of Jerusalem and a look at the events which followed. This book is only available as a PDF file from our website. Sorry, but we do not have any copies to mail out. Download the Days Of Vengeance now. You will need Acrobat Reader, available free from Adobe Systems, in order to view and print this book (32 pages; PDF file size: 737k).